Fully Funding IDEA: A Democratic Dream or Just an Empty Promise? When lawmakers enacted the Individuals with Disabilities Education Act (IDEA) three decades ago, it established a shared commitment to providing “free and appropriate public education” for all student regardless of their disability status. Research at the time suggested that it typically cost about twice as much to provide education for special needs students, and IDEA included provisions to give states funding to help cover these excess costs. At the time, congressional leaders committed to funding 40 percent of the excess costs of educating special needs students through its grants to state education agencies (IDEA Part B). But meeting this 40 percent standard turned out to be an unrealistic goal - today, federal appropriations fund just 16 percent of the additional per student education costs for special education, or $1,843 per student receiving IDEA services. The political revolution of the Senator Bernie Sanders (I-VT) presidential campaign hopes to change all that, promising to fully fund IDEA, while the Clinton camp has proposed similar policies in the past. Full federal funding likely to be part of the democratic platform regardless of the eventual nominee. Yet, IDEA has never been funded anywhere close to the 40 percent threshold, and fully funding IDEA is a very expensive proposal. 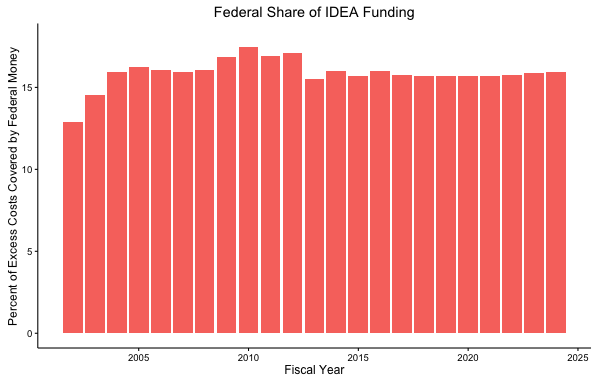 Today, IDEA covers just 16 percent of funding, and while President Obama campaigned on the same pledge back in 2008, not a single one of his budget proposals would have funded the program even remotely near this level. Historically, the largest share ever covered by the federal government came under his presidency, when in 2009 an influx of stimulus funding put federal appropriations over the 30 percent mark for the first time. 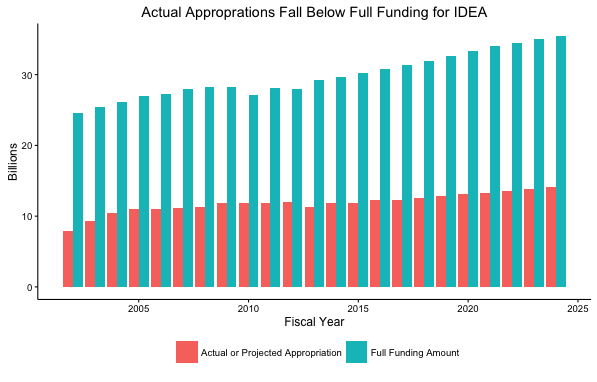 According to New America analysis, this year alone, the new costs of doing so would amount to an $18 billion increase in IDEA appropriations for the upcoming fiscal year, for a total bill of about $31 billion in federal funding for IDEA. Over the next ten years these additional costs climb to just under $200 billion, for a total spending figure of about $329 billion over ten years, just counting federal sources. 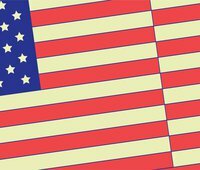 By any yardstick, the costs of fully funding the federal share of providing a “free and appropriate” public education are quite high, but deficit hawks should note that a lower federal appropriation creates problems for states and localities, who can run up against funding and quality concerns without additional federal support. At the same time, declining state-level expenditures for special education have meant that local governments have been required to fill in the gaps in special education funding, a reality that has disproportionate consequences for high-poverty districts. 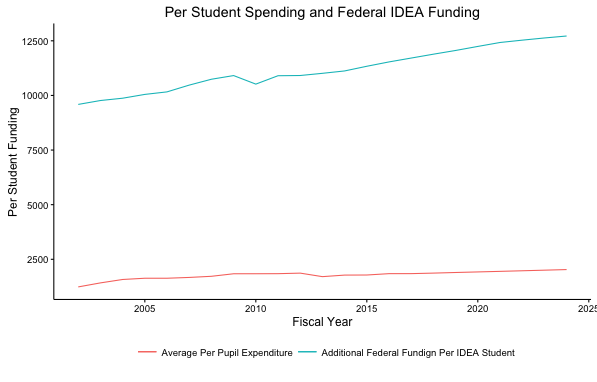 Today, the federal appropriation provides an additional $1843 for every IDEA-eligible student, while the average per pupil expenditure is $11,534. It’s also worth noting that the “twice as much” standard is far from scientific. Actual costs vary substantially based on the diagnosis and severity of the disability and the specific accommodations that are required. More recent research on the issue showed that the costs of education for special education students was 1.90 times that of a regular student in the 1999-2000 school year. But this same research also showed a high level of variation: for example, small, rural districts spent the most providing special education, while poorer districts spent less. Per pupil expenditures for special needs students were as low as $10,558 and as high as $20,095--nearly three times the average per pupil expenditure that year. At the same time, the most common disability diagnoses were some of the least expensive to accommodate. Because of this high variation, determining the share of costs covered in any given year through the federal appropriations process is instead based on the average expenditure for all students. It’s hard to argue against such a disadvantaged population. Yet, while IDEA funding may make for an interesting talking point, but if past is any indication of the future, it’s unlikely that the Democratic candidates dream of making the 40 percent threshold is anything more than hot air."